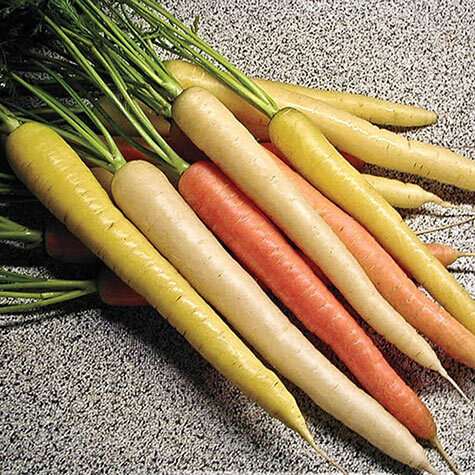 Rainbow Hybrid Carrot | Gurney's Seed & Nursery Co.
Three colors from one variety! 75 days. Not a blend, but one variety of seed that produces three distinct carrots! Orange is full of rich carrot flavor. Yellow is delicious and extra sweet. White is tender and mild. Harvest early for baby carrots or late for 8-10 in. roots. Good for cooking, canning and fresh eating. For each offer ordered, get approx. 500 seeds per packet. Comments: Orange, Yellow and White Carrots- all from the same seeds! This mix is not a blend of three varieties, but one variety that makes a rainbow of carrots! Orange has a rich carrot flavor, yellow are extra sweet, white are tender and mild. Can also be harvested early for delicious baby carrots.